Will this tornado’s dark reign stand? In the grim business of ranking the dead, the Tri-State Tornado of 1925 has no peer. Until that event, the greatest fatality count directly attributable to a single tornado, 317 souls, occurred in 1840. Even the sum from outbreaks of multiple tornadoes are less than the 695 who lost their lives in Missouri, Illinois and Indiana that near-spring day. At the time, the predecessor of today’s National Weather service officially prohibited using the term tornado as it was believed, (until 1948), that the risk of panic caused by the mention of that word far outweighed any benefits that might come from warnings of impending conditions likely to spawn a twister. There were, of course, no such systems to warn people anyway. 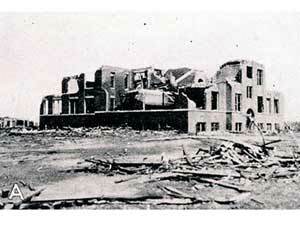 However, in decades since the mid-1920s, many significant advances combined to mitigate the damage done by tornadoes. The scientific knowledge of those factors that cause tornadoes is now both deep and comprehensive. An effective, national weather alert system exists that has, undeniably, prevented the loss of thousands of lives since the days when hundreds perished without warning. Yet at present, a new phenomenon casts a shadow across the accumulated understanding of centuries of weather prediction. While the effect human-induced global climate change will have regarding tornadoes is not well understood, our ability to manage loss due to tornadoes, an ability entirely dependent upon actionable knowledge, is in doubt. The Tri-State Tornado is a study in comparison and contrast between the past and today, earning coverage in History as Prologue for that fact alone. Today, practically everyone has at least heard of the Jet Stream, a common term heard during weather reports viewed on one medium or another. In 1925, the phenomenon was roughly a decade and a half from discovery. Commercial radio, barely five years old at the time of the tornado, had experienced a fad-crazed popularity in the homes of millions of Americans. According to the delightfully entertaining blog, Don’t Touch That Dial, this new medium of communication was a no longer a luxury found only in the homes of the affluent. Radio was healthy and prospering by the end of its first five years. While this era has been historically labeled “the Jazz Age” or “the Roaring Twenties” for the overwhelming majority of the citizenry at the time it was the Radio Era. 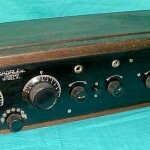 By 1925 there were millions of radio receivers in American homes. That year citizens spent $430 million on radio products. This represented more than twice as much money as was spent on all sporting goods, and about seventy-five cents for each dollar spent on phonographs, pianos, and all other musical instruments. While sports, music and comedy were regular favorites of radio listeners, weather reports, if they even existed on a given channel, were not routinely consulted. In the rural parts of Missouri, Illinois and Indiana, farmers were often the most reliable and vigilant sources of weather prediction. Their work depended upon this skill as did their very lives. On a darkening Wednesday afternoon, though, the combination of intuition and experience would prove inadequate for scores of farmers on that last day of their lives. There are several definitive accounts of the events on Wednesday, March 18, 1925 that are linked in this section. For a more detailed account of the Tri-State Tornado, the reader is encouraged to consult those sites, including a both the well written account in Popular Mechanics and National Weather Service Weather Forecast Paducah, Kentucky office’s official page on the Tri-State Tornado. Here are the basic details of historic tornado’s devastation. Though the Tri-State Tornado’s origin is near Ellington, Missouri, many meteorologists still refer to the Murphysboro, (Illinois), Tornado. 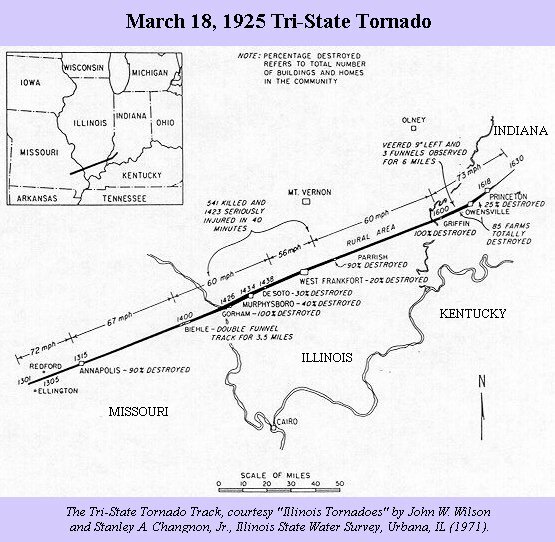 The twister formed at approximately 1 p.m. local time and traveled as if on a radio beam at 69 degrees, (grid), making a direct hit on the Missouri town of Annapolis. 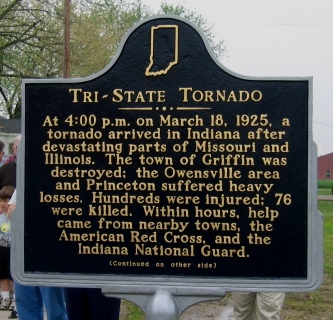 The tornado stalked the Show Me State for just short of an hour-and-a-half before crossing into Southern Illinois where it would claim its greatest toll in both deaths and property damage. Moments after crossing the Mississippi River, the tornado completely destroyed the small town of Gorham, Illinois, killing 37 people, nearly three times the number killed during the eighty-some minutes the tornado had been on the ground in Missouri. Eight minutes later, the 5000 residents of Murphysboro experienced the carnage that forevermore would link the town’s name to the deadly cyclone. 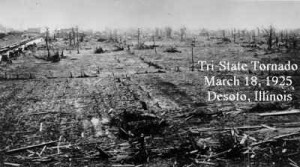 Of the 611 persons killed in Illinois by the Tri-State Tornado, 243 lost their lives in Murphysboro, whose population at the time was 5000. Forty percent of the town was demolished, including, according to the account in the Popular Mechanics article, Longfellow Grade School where 11 students perished and more than 200 were trapped until rescued by frantic survivors from the area who rushed to save the town’s children. The economic impact of the storm’s damage was likewise devastating with recovery beginning only after twenty years of unremitting decline, including the full duration of the Great Depression. 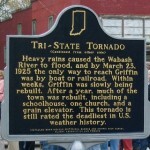 By 4 p.m., when the tornado crossed the Wabash River into Southern Indiana, it had been on the ground constantly for three hours. It would not abate for another 30 minutes; it would not cease until claiming another 71 victims. 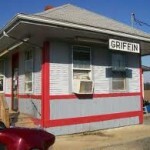 Twenty-five of those killed in Indiana died in the tiny town of Griffin, Indiana, with a current population of roughly 170. 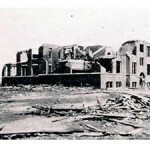 Every structure in the town was destroyed. According to Posey County Historian, Glenn Curtin, the scores of wounded needing hospitalization after being rescued by survivors and residents of nearby towns and farms had to endure the 30 mile drive over crude roads to Evansville. Griffin rebuilt, naming one of the main cross streets Tornado Street. Prior to consolidation, the local school’s junior high and high school basketball teams were named the Whirlwinds and the Tornadoes respectively The old railroad depot located at the south end of town is now a diner and service station, the tracks long since pulled up. 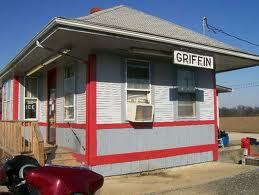 Griffin lies just north of Exit 4 on Interstate 64 coming in from Illinois and travelers that stop in for a home-style meal are unlikely to know the story of natural fury visited on the town in nearly a century ago. Angie Norman, owner of the Depot Diner, shared during a phone conversation that the lone survivor of the event, a small child at the time, was recently moved to a nursing home in New Albany. If a visitor did happen to take a quick tour of the town, the only visible reminder of the tragedy would be the state’s historic marker located near the center of town. The tornado left Griffin and traveled for another 18 minutes, completely destroying 85 farms in Posey and then Pike Counties. The final deaths, 45, occurred in Princeton, Indiana,. Twelve minutes later, the tornado dissipated, ending its three-and-a-half hours, 219 mile visitation of horror and waste. Most climate scientists agree that future weather will be characterized by far more chaotic weather…It also can be said that in one way climate change is already changing all global weather including tornadoes. This is so because climate change has already caused changes to the global climate system such as raising ocean temperatures and increasing the amount of water in the atmosphere. Increased ocean temperatures and the water content of air have an effect on the amount and timing of precipitation that is being experienced in any one location. And so a strong claim can be made that climate change is now at least partially responsible for all global weather although the part played by climate change could be small for any individual climate event relative to other causes such as normal ocean circulation patterns. Yet, no tornado or hurricane experienced recently would likely be the same without some contribution from climate change. That is no tornado would appear at the same place, the same time, with the same wind speed without changes to the climate system that have been caused by human impacts on climate And so every tornado is very likely affected somewhat by climate change. That is although strong tornadoes have occurred before recent human-induced climate change, no recent tornado is likely to have happened in the same way at the same place in the absence of global warming. It is important to note that the increased amount of moisture caused by the average rise of ocean surface temperatures due to global climate change, (approximately 1 degree Centigrade), is not always linked to the warm air masses involved in all tornadoes. However, air masses affected by the Gulf of Mexico’s evaporation are measurably contributing to the amount of moisture in warm air masses involved in the formation of tornadoes. As Professor Brown states in his post, there exists a great deal of scientific uncertainty as to any link between the number of tornadic events. What the great preponderance of evidence does suggest is that, for those tornadoes that are affected by global warming, the intensity of those tornadoes will likely be greater than those produced without the effects of climate change. This Monday, March 18, 2013 marks the 88th anniversary of the Tri-State, or Murphysboro Tornado. Since that fateful event, technology, awareness and warning systems have significantly reduced the loss of life caused by tornadoes. To compare between 1925 and today the human ability to predict and take shelter from tornadoes is to acknowledge two dissimilar times. However, there are other factors that defy similar comparisons between the weather conditions of 1925 and those of today. The Tri-State Tornado is reliably estimated to have been what would now be classified as an F-5 twister, the most powerful rating on the Fujita Tornado Damage Scale, developed in 1971. Winds were estimated to have been in excess of 300 miles per hour in the tornado. But there is a near certainty that the unprecedented conditions of greater moisture composition in future warm air masses that help form tornadoes will produce tornadoes with unprecedented amounts of energy. Warning times continue to increase for those in the path of a tornado. Quick action by those in danger, combined with more accurate prediction and tracking capabilities available to meteorologists, will continue to save lives. However, for populated areas likely to be in the path of tornadoes with never-before-seen levels of energy, the concept of safe shelter must be redefined. The Tri-State Tornado of 1925 spent most of its long journey in lightly populated rural areas at a time with the U.S. population was less than a third of today’s population. As it’s been noted, there has not been a tornado that has come close to challenging as equal the bloody and economically devastating losses of that March day. Nevertheless, to ignore – or worse, deny – the likelihood that such a cyclone looms in the future is irresponsible in the extreme.